Cool CD Ripper is an extremely easy-to-use CD ripper for Windows 9X/NT/Me/2000/XP. 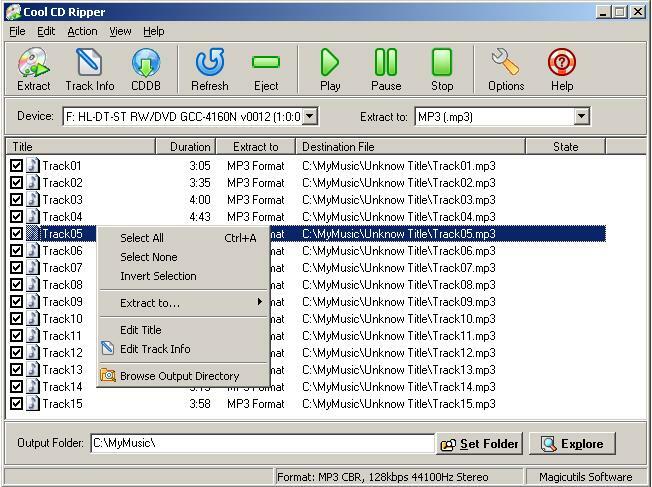 Cool CD Ripper rips audio CD tracks and save them into audio formats MP3, WAV, WMA (Windows Media Audio 9), and OGG Vorbis on-the-fly. Cool CD Ripper uses lame encoder of newest version(3.9.31) that supports full MP3 options with VBR properties, also Cool CD Ripper supports WMA v9 format(VBR also supported). Free CDDB is supported. ...... Free CDDB is supported. If you want to make your own MP3, WMA, OGG files from audio CD, Cool CD Ripper is exactly what you are looking for. With full CD audio playback control function, Cool CD Ripper also work as a freedb-aware CD player. Qweas is providing links to Cool CD Ripper 1.31 as a courtesy, and makes no representations regarding Cool CD Ripper or any other applications or any information related thereto. Any questions, complaints or claims regarding this application Cool CD Ripper 1.31 must be directed to the appropriate software vendor. You may click the publisher link of Cool CD Ripper on the top of this page to get more details about the vendor.